Fall damage is % based, having more health just means it takes even longer to regen but you take more falling damage. EDIT: Say you take 30% of your max health as damaged, with 1000 hp that’s 300 damage, with 5000 hp that’s 1500 damage, but regen stays at its 25 hp/second or whatever it is. EDIT 2: Regen really should be % based as well. and it absolutely should NOT be. let’s change the perspective here. if a baby falls 10 feet, he loses like 1hp. if an adult falls 10 feet, he loses 10,000 hp? this is what it’s like for players with a percentage loss. NOTHING in this game should be percentage lost… players skill up their characters to become stronger, not weaker! actually this is the only thing that makes sense to be percentage based, because as your character levels up there is a lot more HP to recover. 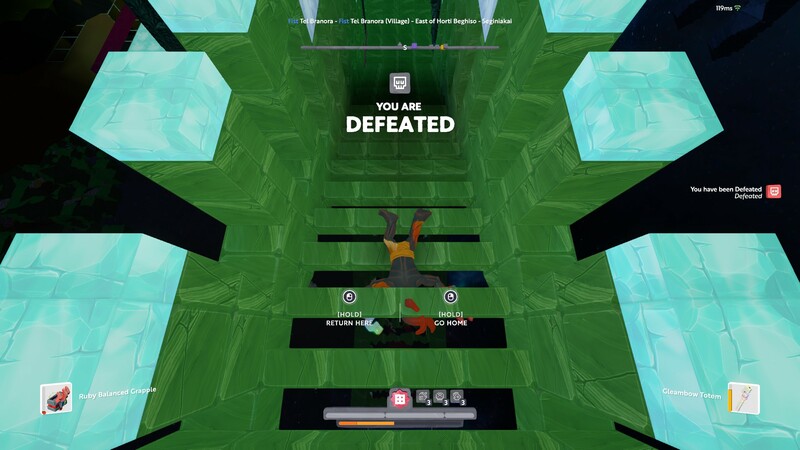 if a high level player recovers the same amount as a low level player he will have to stand in a protected hole for 20 minutes to regain health where a low level player would just wait 10 seconds. Yeah I think flat damage would be a lot better, a model along the lines of 50 damage per block you fall over 5 blocks or something. I would also love to have block that completely negates falling damage like leaves used to. I haven’t tried trampolines but even if they completely stop it its not an ideal solution. Im hearing sponge does that. I do miss using leaves to fall on pre-launch. Now its like falling on a concrete tree painted green. Tested it and I still took falling damage, even though it was reduced. Well, does it possibly to make some additional fall resistance for jump skills? And Falling Armour skill looks like some kind of garbage, because you have only 300 points of armour at all. It’s not useful when you take 700 damage just by double jump above stone. Also, I created a second character yesterday and spend 6 points to Agility. So now he takes damage when running at stone stairs. Yeah, fall damage shouldn’t be percentage based. To me it feels like picking hp increasing skills punishes players. Having regen % would be better than how it is now. Falling Armour skill looks like some kind of garbage, because you have only 300 points of armour at all. It’s not useful when you take 700 damage just by double jump above stone. Just by looking falling armour skill tool tip and how falling damage is percentage based, it just favours more low hp pool skill builds, which is doesn’t look right. Haven’t actually invested points to falling armor to test this with different builds. Beside we have falling armour and falling resist stat both, but only armour skill. I think Falling Protection skill must increase resistance too. since the gleambow race event it has really become apparent that this needs some attention. we are being forced to race and use our grapples to the maximum of their abilities, which means a lot more deaths from fall damage. I’ve been more conscious of this lately and purposely releasing after fully retracting (reeling-in) the grapple, yet just now I had grappled to a tall 1x1 foliage tower, about 3 blocks up from the ground surface. reeled in all the way, released the grapple and fell 3 blocks. don’t think that is right either.